Arkansas City Flea Market. 712 W. Washington Street. 7 blocks West on Washington off Highway 77. Ample parking. Approximately 80 dealers. Inside market. New merchandise, electronics, housewares, tools, jewelry, toys, sportswear. Used merchandise, antiques, collectibles, glassware, primitives, farm and ranch collectibles. Snack bar, restrooms, h/a. Space $10. Camping available. c/p Don Jackson, Box 290. 67005. (316) 442-0848 or 442-9566. Seasonal market. Reservations recommended. Concordia Flea Market. 1 mile North of town. New and used merchandise, collectibles, decorator items, farm items. Market does special promotions and has a great selection of locally made crafts. c/p Charles Chartier, Box 98. Clyde, KS 66938. (913) 446-3411.
primitives, and advertising items. Indoor Climate controlled building. Concessions, Restrooms. 12'x10' Space $25.00. Table rental $4.00. Reservations suggested. MID-AMERICA MARKETS, INC., P.O. Box 1585. Hutchinson, Kansas 67504-1585. (620) 663-5626. Boulevard Drive In Swap Shop. 1051 Merriam Lane. Boulevard Drive In Theatre. Market opens at 7 am and runs until dark. Admission charge. Ample parking. Average attendance 1,200. Approximately 150 dealers. New merchandise, electronics, tools, housewares, sports merchandise, toys, sportswear. 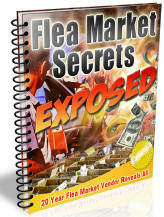 Also used flea market finds, garage sale type items, crafts, collectibles, produce. Space from $5. per day. Snack bar, restrooms. Space from $3. c/p Wes Neal. 1051 Merriam Lane, Kansas City, KS 66103. (913) 262-2414. Airport Flea Market. Near Manhattan Airport. Free admission & parking. Ample parking. New and used merchandise, crafts, collectibles, produce. Snack bar, restrooms, h/a. Space from $8. daily outside and $10. daily inside. c/p Market Manager, 723 Moro St. 66502. (913) 776-6906. Opolis Flea Market. At the junction of Highway's 171 & 57. Hours 9am-5pm. Ample parking. At the Missouri state line. Approximately 15 dealers. Market is heavy on antiques, collectibles and antique auto parts. Auto enthusiasts will find some really nice and very unusual antique auto items & accessories at this market. Lots of old Volkswagen stuff. Snack bar, restrooms. Inside & outside space available from $8. c/p Norma Kukovich, Box 42. 66760. (316) 231-2543. Oswego Flea Market. Junction Highway's 59 and 96. Ample parking. Country market with used merchandise, bric-a-brac, housewares, clothing, crafts, collectibles, produce. Food available, restrooms. (316) 795-4415. Village Flea Market. 2301 S. Meridian. Approximately 100 dealers. Antiques, collectibles, primitives, crafts, produce, lots of secondhand and garage sale merchandise here. Snack bar, restrooms, h/a. Inside and outside space available from $30. per weekend. advertising items, primitives, and furniture items. Large Indoor market. Concessions, Restrooms. 8'x10' Space $25.00. Table rental $4.00. Reservations strongly suggested. MID-AMERICA MARKETS, INC., P.O. Box 1585. Hutchinson, Kansas 67504-1585. (620) 663-5626. Treasure Plaza Flea Market. 4201 S. Seneca. Ample parking. New merchandise, antiques, collectibles, giftware, crafts. Restrooms, snack bar, h/a. Indoor market with mainly permanent spaces. Space $44 weekly or $125 monthly. Market has retail consignment auction on Sunday's. c/p James Smith, (316) 522-9480. The New Ponderosa Flea Market. 2427 W. Pawnee Street. 67213. Ample parking. New merchandise, gifts, imports, used desirables, collectibles. Snack bar, restrooms, h/a. Indoor and outside space available. c/p Carroll Ghan, (316) 941-9953.